I gave up on you David Bowie. The first album I remember coming out was “Never Let Me Down”. I was 5 or 6 years old. The artwork on records at that age are magical, and the bizarro circus business on that one was no different. While that record may seem to be one of his most cringe worthy from 2013’s perspective, I will always love it. Even “Too Dizzy” the song that has subsequently been excised from the record for it’s misogynistic, violent content. It’s still a pop song, it’s still snappy. I don’t even consider it one of the lesser tracks on that record, but I digress. My folks went to one of the Glass Spider tour shows, they brought us back pins, I still have mine, a little paper Bowie head with a latch on the back. My Dad liked those 80s records the best. Most of those 70s records were a little too weird for him. He stuck around through the first “Tin Machine” record, it’s still rocking enough to keep his attention. By 1995 I was deep into becoming a Nine Inch Nails fan. I tried to talk my Dad into taking me to see them tour with Bowie (Not to mention opening act, Kevin McMahon’s group Prick, who haven’t played a west coast show since). It was decided that I wasn’t a big enough Bowie fan to justify the expense. We lived in rural northern California, it was a big, costly ordeal to go to any big show. Nine Inch Nails wouldn’t tour again for five years. It would be seven before I got to see Bowie. I spent those years amassing copies of everything the man had ever released. Skip ahead to 2002 which brought the ‘Heathen” album, a more stately affair than his eccentric 90’s output. Touring for the album was pretty limited, but I was able to catch a set on the short “Area2 Festival” tour outside of San Francisco. Alongside Moby, Busta Rhymes and the Blue Man Group David Bowie played 80 mins or so. At sunset. It was pretty much everything I had hoped it would be, excepting perhaps the steady thump coming from the DJ tent in the parking lot. 2003 brought his last album, “Reality” and the largest tour of Bowie’s career. We caught a show at the beginning of 2004 at a hockey arena in San Jose. Our seats weren’t great, I drank too many overpriced “hard” lemonades before the show and spent most of it going back and forth to the bathroom. None of my party was overly impressed with the show and they were all stunned at how small my bladder can be. The show itself was good but not great. The tour got cut short when Bowie had some heart troubles during a European leg. Forgetting a few unremarkable awards show appearances in the next couple years and a great cameo on Ricky Gervais’ “Extras” the gentleman would virtually disappear. Occasionally popping his head out to issue a short email denying something that the media was running with. Every few months a paparazzi photo would appear, with Bowie in casual clothes, walking down a New York street with his groceries. Retired as far as anyone could tell, settled into a quiet life at home with his wife, Iman, raising their young daughter. No one could begrudge him that. He had given us all so much great art. I slowly accepted that David Bowie was probably done. I eventually gave up hope that there would be a return, another song, another performance. Maybe the long promised Anthology would come one day but that was probably the best one could hope for..
A few minutes after 9pm, or Midnight Eastern Standard time on January 7th (or the earliest moments of the 8th, in New York), David Bowie gave us all a present for his Birthday. With a short social media post directing our attention to his official website, we all discovered that there was a new single, with a bizarre art video by Tony Oursler strongly reminiscent of the “1.Outside” era imagery., Alongside it were pre-orders for a new album, coming in a few short months. I thought it was a joke until I got the video was playing. I couldn’t believe it. Vibrating with energy, I was beside myself. My wife was on the other end of the couch when I found out, I recorded her telling a hilarious version of this moment for my podcast, but of course, my computer crashed and wiped it out. The track, “Where Are We Now?” is mellow, a look back at his legendary late 70’s in Berlin. Seemingly pointing towards a Leonard Cohen styled return as a more jazzy elder statesman. In the days that follow, various news outlets reported that Bowie himself would be doing no press and probably no performances for this record. In his stead, producer Tony Visconti and the various band members would be the voice, and that voice was indicating that the first single was not exemplary of the record, not at all. On the 25th of February a second single “The Stars (Are Out Tonight)” and accompanying video, were revealed. A much more rocking typical Bowie song. The video, the work of Floria Sigismondi (who did a video or two for Bowie in ‘97 and some of the freakier early Marilyn Manson videos), let Tilda Swinton star, both alongside Bowie as his wife and as she has done in countless fashion shoots over the last decade, as a sort of parody of/ homage to Bowie himself. The buzz around this release blew over quickly as on February 28th, a little over a week early, the album begun streaming on iTunes. As it is when something reaches the internet, within hours it was everywhere, and everyone had their opinion. I, having pre-ordered no less than 4 copies of the record (the itunes version that was announced with the first single, the deluxe cd edition with “bonus” tracks, a vinyl copy and, finally, the japanese “blue-spec” version with yet another bonus track. yes I have a problem. ), had no problems with burning off a copy of the stream. My first play came in traffic, in my car, on the way to work (minus the last track which I listened to in the parking lot). Now, as a self proclaimed Bowie Freak, I read all the reviews that had trickled out the last few days before. I tried to ignore the four star ratings, the gushing. I tried to listen to it on it’s own, but it’s a hard thing to do. 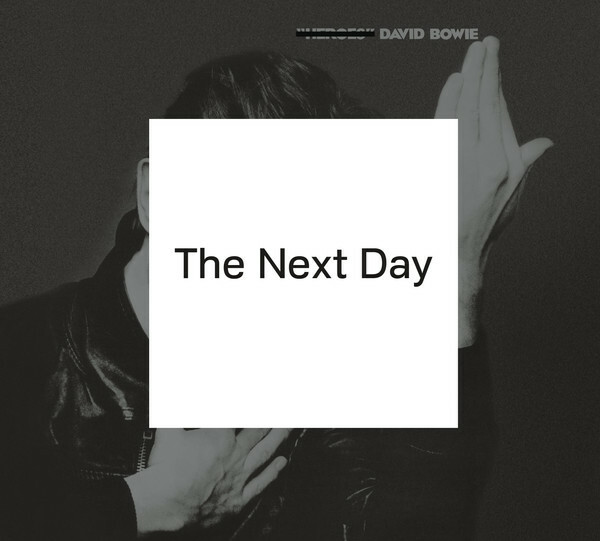 “The Next Day” is a very self- referential album and like “Lodger”or “Scary Monsters” before it, there is a bit of something for everyone going on. Being as we have little information about how the writing process for this album went, we don’t know how far back he was working on this material. We know the actual sessions started about two years ago, in a rehearsal room in New York. Bowie himself on keys or guitar, Tony Visconti on Bass, Gerry Leonard on Guitar and Sterling Campbell on drums working from Bowie’s home demos. In terms of the sonic palate of the album, it is most directly a continuation of the ground covered on ‘Heathen” and “Reality”Probably as much a product of the players involved, as of where the artist is at ten years later. The drum sounds often reminded me more of “Let’s Dance”. There is a under current of “Ziggy Stardust” era low mixed grungy saxophone throughout much of the record. A couple of the songs point to even earlier days, seeming like 60’s throwback tracks conceived during the unreleased 2001 “Toy” sessions. Many of the tracks fade out before you’re finished with them, as “Low” did earlier. A couple songs have the experimental electronic flourishes of “1.Outside” & “Earthling” The record almost seems like a study of the David Bowie recipe book. There hasn’t been time enough to become familiar with the songs yet, to judge them as they are, on their own merit is impossible. You can only to paint them with the brush of what has come before. After a single listen i’m left curious as to how “The Next Day” will be looked back on. Is it really good or are we all just glad to have the old duke back? In any event, David Bowie, I’m sorry I gave up on you, it won’t happen again. Wow, what an incredible post! Did not expect such a good read when I went to your site–just expected your amazing artwork! So, tell me, now that you’ve had time to sit with it, what do you think! ?